1. Have you received a diagnosis of illness? 2. Do you feel sick? 3. Do you think about being sick right now? 4. Do you resent your disease? 5. Do you think about how much you want this problem to go away? You may answer yes to the first 5 questions. But in truth, the answer to the last one is no. You are not sick. Your essence is wholeness, life, health and vitality. You are the creator of your life, and you are a creation of Spirit, God, the universe… Neither the creator (you) nor the creation (you) can be sick. Sick is not what you are. It may describe how you feel and more importantly, how you think. But it is not what you are. There is little need to delve into the past and ask yourself why you became sick. What specific thoughts and feelings contributed to the outer manifestation of sickness in your experience? What you need to realize now is that no matter what happened in the past, it was your own thoughts and feelings that contributed to the experience of illness. And if your thinking and beliefs made you sick, they can restore wellness just as easily. This may seem hard, but it’s a matter of awareness. Before this, you weren’t aware of what you were thinking and maybe not even aware of your true feelings. But now you must be, because only by being truly aware, and without judgement, can you make yourself well. Wellness is a process. All of life is a consciously evolving process. If you want to have a healthy mind and body, you need healthy thoughts and feelings. Use affirmative prayer, meditation, music, books and other materials, and the conscious support of like-minded people to evolve toward wellness. You may choose to find a holistic practitioner and/or one who offers Reiki, ZPoint, Quantum-Touch, or other services, along with any other treatment of your choice. Competent professionals in any field will be willing to work with you and accept the ttreatments you choose, medical and non-medical alike. You don’t have to be sick… Unless you think you must. Do you choose to believe what an outside source (doctor, relative, friend, etc) tells you? Or do you believe the spiritual truth of your being: that you are complete wholeness, immediately, now and eternally? so why would we, and how could we own it? Yet how could we not? Metaphysical science, Unity, religious science, and New Thought have many common beliefs. One that stands out at Christmas time is the idea of Christ. Although most of us believe Jesus existed, we see him as a teacher, a wayshower, and no better than any of the “rest” of us humans experiencing life on earth. Christ is a state of consciousness. It is already within us; our purpose is to become knowingly aware of it and to demonstrate, or show it in our lives and the world around us. It is at Christmas that we focus on the Christ mind within us. Though every day we can renew the Christ child within, we’re especially mindful during Advent and Christmas. Remember that the season of miracles and giving is not just when it’s magically bright, cold (or hot), with carols ringing through the air. These are just outward manifestations of an inward consciousness or state of mind: the belief, as in Santa Clause, that anything is possible. Because truly, anything is possible, not just at Christmas, but all year long. And the more we let the Christ light shine within us, the more light we see in the world. As peace and love are now unfurled. The greatest gift of Christ in me. Lit from within by God divine. In harmony we all unite. Where there was not a light before. And in the light, the darkness fades. Now comes the dawning of the day. And share with all your gift of love. 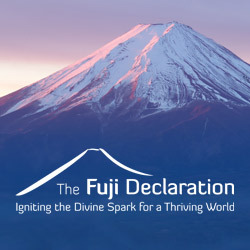 Since I’m now the official unofficial music director at my spiritual center :), I was asked to find music to fit a talk about connection. I scoured my rather extensive music collection, and it wasn’t that I couldn’t find a song… I just couldn’t find one that fit my sense of the message, and one I knew everyone would be able to sing. On this particular Sunday, other members and I also went to a local Pride festival. I went last year and enjoyed it immensely! All these people walking around, some gay, lesbian, bi, and transgendered… And some people were wondering who was who. Well, I didn’t care. Physical blindness has its advantages, and this is one of them! 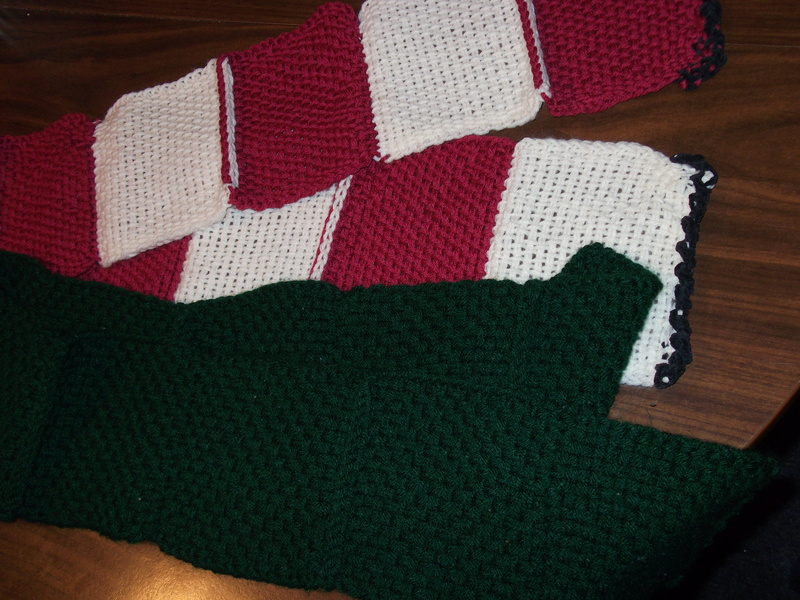 Take a good look at these scarves. What thought or feeling came up when you saw them? Do you think they took a long time to weave? Do you admire anything about them? Would you give them to someone as a gift? Does knowing I wove them bring up any thoughts about me? What “must” I be like if I’ve woven these? 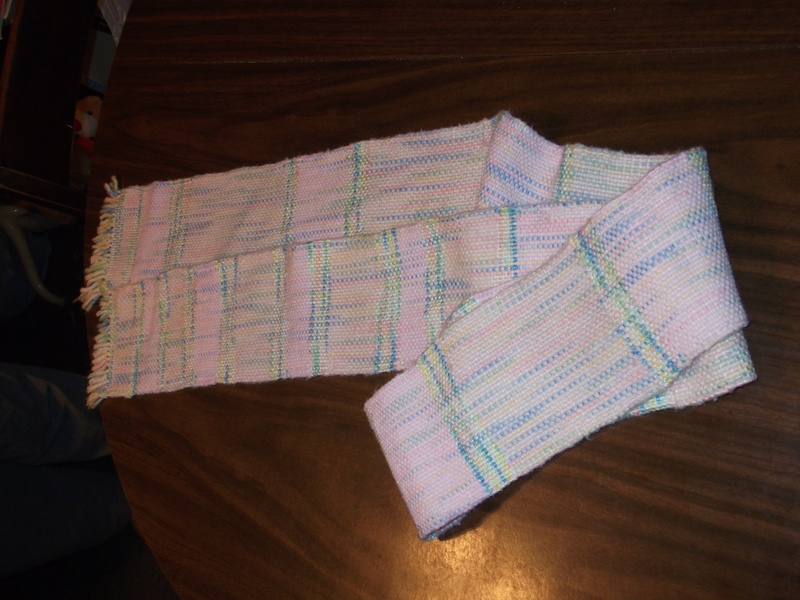 Now, what if I told you these scarves were woven on a potholder loom? Many remember those little frame looms – a square with 18 or 20 pegs on each side – that you stretched cotton loops across. Then you wove more cotton loops over-under-over-under the first ones to make a square. And if you got tired, a parent or other long-suffering adult would finish the edges for you. How many kitchens did these squares adorn as potholders, maybe stitched together into placemats or trivets for protecting the table from hot dishes? Maybe, if you think the others were woven on a “real” loom. Or if you have preconceptions of what small frame looms can – and can’t – weave. But it’s all in your perception. And therein is the whole “secret” of life: How we think of, feel about, and experience things is all a matter of our perception. And the best part is, we can change our perceptions at any time! Feel bad? Then change your perception to one that feels better. Feel good? Great, then it can only get better. Your perception is your responsibility. You can’t blame anyone for anything – well, you can, but that’s still just how you believe it is. Doesn’t finding something better, feel better than being stuck in blame? I speak from experience when I say it absolutely does! But don’t take my word for it… After all, my perceptions are my own, and not yours! This “simple” question has filled volumes and will probably continue to fascinate humankind for our entire existence. I am not a theologian and don’t intend to be. However, I know universal truth, aligned with the Law of Attraction, Metaphysics, and New Thought. Similar belief systems include Unity and Religious Science. It is this absolute truth I present here as what God is. These are not attributes of God. Attributes, or characteristics, are adjectives. They describe what God is like: loving, compassionate, etc. In contrast, these are nouns – concrete things, though abstract to our understanding – that you could substitute for the word God: God is beauty. It is no less accurate to say God is beautiful. But God is not only beautiful, but is beauty itself. The very idea of beauty is the same as the idea of God. I’m not going to give definitions of all the things God is, here. Just remember, when you feel peace, you are experiencing God. When you feel aware of something, you’re feeling God. Also keep in mind that this is not an all-inclusive list of what God is! If you find a list like that, let me know! 😀 Rather, this is a sampling, and in fact just my own limited human understanding, of what God truly is. When contemplating this and articulating your own beliefs about God, think on this. If you believe that like attracts like, then you must also believe that whatever you think God is, will attract more of that to you. For example, “God is love” attracts more love to you. But “God is angry” attracts anger. Many traditional religions believe in an angry, punishing, vengeful God. And they are perfectly welcome to believe that. Just consider the ramifications of your own beliefs about what God is. If you like those ramifications, keep believing what you believe now. If, however, you don’t like them, know that you’re free to change your beliefs at any time and adopt more positive ideas about what God is and about anything else in your life. Because as you believe it is so, so it is in your life.